Set back in the hills near Menomonie is a place that looks like it’s been stolen from the German countryside and place in our little nook of Wisconsin. The Cottage Winery and Vineyard, which opens in late May, has just that vibe going for it. “There’s not too many wineries that can boast the surrounding that we do,” co-owner Teresa Jorgensen said. If first impressions mean anything, The Cottage succeeds in impressing. Tom Jorgenson – Teresa’s father and co-owner – who took inspiration from the European countryside and decided to incorporate it into their winery. 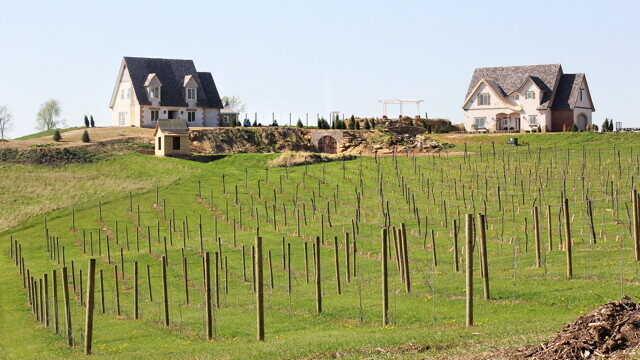 The winery has been constructed on top of a large hill that overlooks the rolling Wisconsin countryside. From the top you can follow the waterfall down and see the vineyard that stretches from the bottom of the hills to near the road. Teresa said there is about two acres of vineyard with around 1,000 plants. One thing that Teresa and Tom said they set forth in doing with this a winery – besides offering wine – is to hold ceremonies and weddings. Two locations have been set aside for such occasions. One on top of the hill overlooking the wilderness below and accompanied by a pergola for the band. The second is near the vineyard at the bottom of the hill settled next to the waterfall. Smaller events are also in the works. Teresa said she wants to hold sports fundraising events for things like bocci ball and kubb. An art room has likewise been set aside for some of the up-and-coming Valley artists. Teresa said that keeping the winery local – from the food and wine to special events – is of great importance to her. “We’ve got plenty around here so why not help with what we see every day,” Teresa said. Walking the grounds, the winery has a distinct personality that will communicate to visitors. And that’s very much intended – to make the winery a destination and not just another winery.